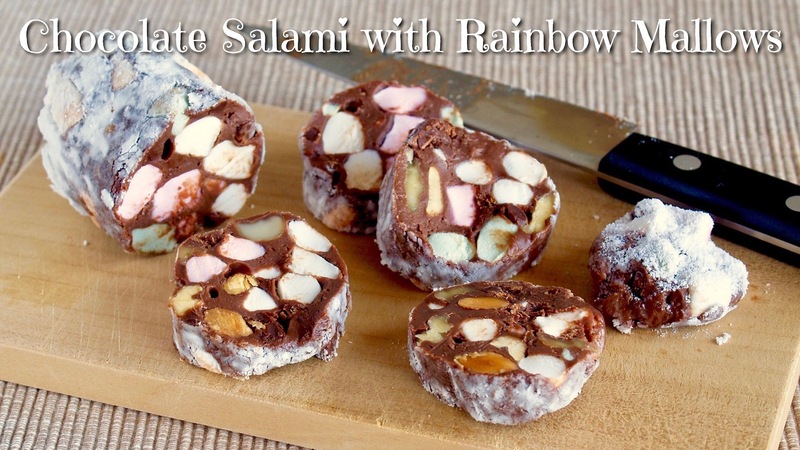 Fun snack idea for kids! Homemade soy milk chocolate custard cream makes it very dainty! 1. Mix egg and sugar in a bowl. 3. Add soy milk and mix well. 4. Transfer to a saucepan (strain to remove the lumps if you can), put on low, stir constantly, and stop the heat when the cream starts to thicken. Mix well with the remaining heat until smooth. 5. Break in some chocolate, then leave to cool. 6. Cover the saucepan with plastic wrap (make sure the cream sticks to the plastic wrap to keep from drying out). Cool in the fridge until cold. 1. Put OREO cookies in a Ziploc bag then crush them. 2. 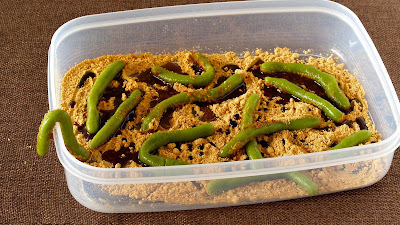 Mix some cookie crumbs to the chocolate custard cream. 3. 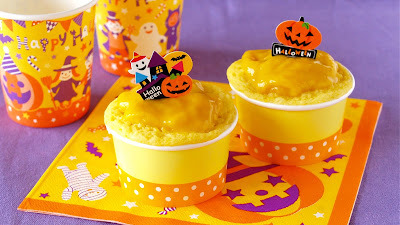 Spoon the cookie crumbs and the custard mixture alternately into cups. Top with cookie crumbs. 4. 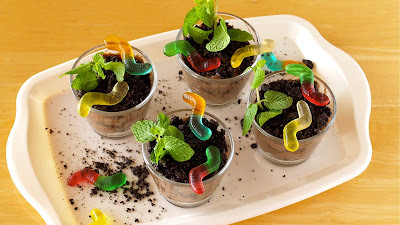 Garnish with mint leaves and gummy worms to finish. This is fun for babies!!! 5. Top with Kabocha Pudding to finish. 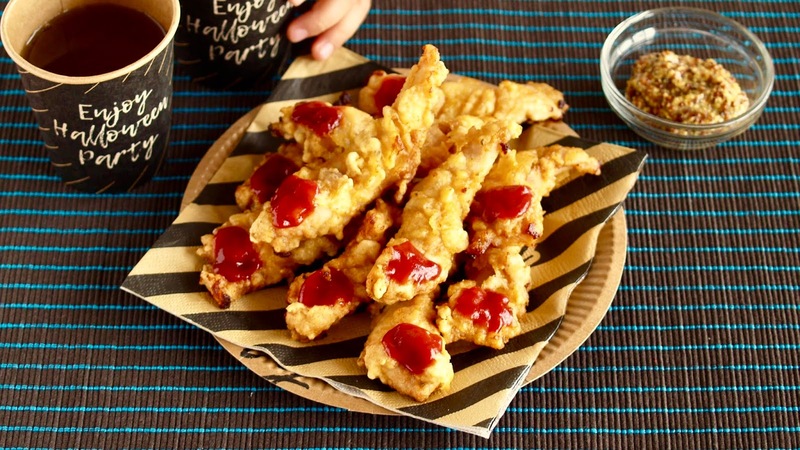 Chicken Rice (also called Ketchup Rice) is a very popular rice dish used for Omurice (chicken fried rice wrapped with a thin sheet of egg). 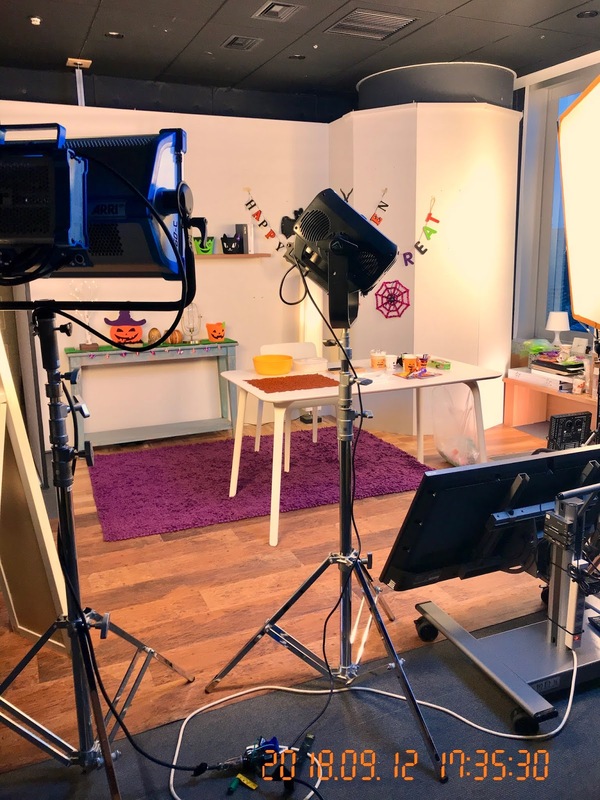 Many Japanese kids love it!!! 1. Dice the chicken and chop the onion. 2. Heat 1 tbsp. of cooking oil in a frying pan and cook the chopped onion until tender. Add the diced chicken and cook until no longer pink. Then add sliced mushrooms and 8 tbsp. of ketchup. 3. Add warm cooked rice, when they are evenly coated with ketchup, season with salt and pepper. 4. Wrap 80g (2.8oz.) of chicken rice in plastic wrap, form it into a ball shape, then tie it with a twist tie. 5. 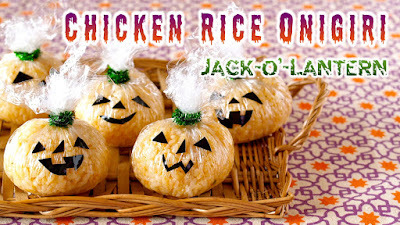 Cut a black tape or sticker to make face parts of Jack-o'-Lantern, then put them onto the plastic wrap. 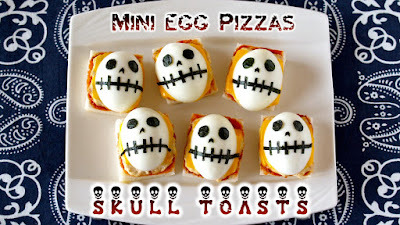 Quick, easy, and yummy Halloween party idea!!! 1. Cut off the crusts of the bread and cut into quarters. 2. Spread the pizza sauce (don't apply all, just a thin layer is ok). 3. Drain the canned tuna, mix mayonnaise, then spread it on the bread (don't apply all, just a thin layer is ok). 4. Cut sliced cheese into quarters, and place them on the bread. 5. Toast in the oven until the cheese melts. 6. Cut hard-boiled eggs into half lengthwise and place them on the toasts. 7. Make the face parts with Nori sheet and attach them on the eggs. NOTE: Instead of pizza sauce, you can use tomato sauce, ketchup, or simply diced tomatoes. In some countries, ketchup and tuna are too salty, so please adjust the flavor in the way you like. 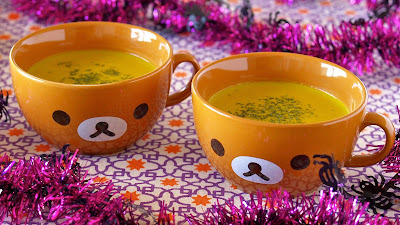 I used Kabocha (Japanese squash) with skin! Kabocha skin contains a lot of vitamins, so why don't you eat it! You can replace Kabocha with sweet potato, too. 1. Dice Kabocha into 1/2inch (1cm) pieces. 2. Mix A in a bowl. 3. Sift in B and mix with a spatula just until blended. Then mix in diced Kabocha. 4. 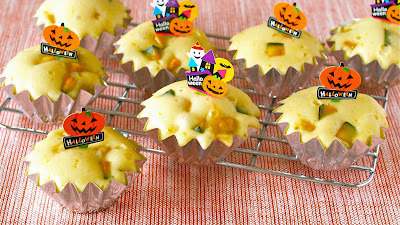 Spoon the mixture into the thick foil cupcake liners up to 80% full. Drop them lightly on the counter to raise the air bubbles out of the batter. 5. Place them in a frying pan. Add 200ml hot water and put on high heat until water boils. Turn the heat down to low, cover, and cook for 15 minutes. 6. Remove the lid carefully to prevent the water from dripping onto the cakes. Place the cakes on a wire rack to cool. Kabocha melts in your mouth. yummy!!! 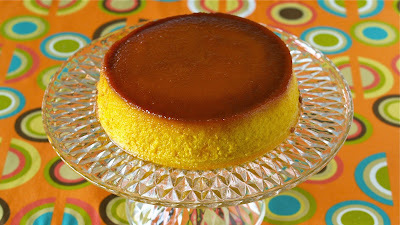 Compared to the regular flan (pudding), the texture is firmer, so you can cut and serve like a cake!!! 2. Pour the sauce into the cake pan before it gets hard. 1. Wrap Kabocha with plastic wrap and microwave at 600w for 8 minutes. Scoop out the Kabocha flesh with a spoon. Then strain through a strainer. 2. Beat eggs in a bowl, then mix in a few drops of vanilla extract. 3. Add milk and sugar in the saucepan (which you made the caramel), then heat until warm. *you can clean off the caramel at the same time, not to waste it. 4. Mix in the warm milk mixture (4.) into the egg mixture (3.). Add the mixture into the mashed Kabocha. Then strain through a strainer to make it smooth. 5. Pour the mixture over the caramel in the cake pan. 1. Preheat the oven to 170C (338F). 2. Place the cake pan on a baking sheet. Pour some hot water (half the height) into the baking sheet. Bake at 170C (338F) for 50 minutes. 3. Place it on a wire rack to cool and put in the fridge until cold. Flip it over onto a plate to serve. Note: You can grease the pan with some oil or butter so the pudding will slip out easily.